Nadi Shodhana Pranayama (alternate nostril breathing) is an easy style of alternate Nadi respiration, and appropriate for starting and advanced students. It is also named as “sweet breath” Nadi suggests that channel and refers to the energy pathways through that prana (energy) flows. Shodhana suggests that cleansing; thus Nadi Shodhana pranayama suggests that channel cleanup or we can say this is channel (gate in which prana or energy is flows or energy pathway) cleansing process. Sometimes this process is also known as Anulom –Vilom. But in Anulom – Vilom Pranayama there is only one process. So Nadi shodhana pranayama is the advanced level of Anulom – Vilom pranayama. People who are master in Anulom – Vilom, they can perform this. You can perform Nadi shodhana pranayama in four different way or we can say that in this process there are four levels. You have to perform one by one each level systematically. It is the best process for purifying the Nervous System. Pronunciation: – (nah-dee show-DAH-nah) or the sweet breath. Nadi = channel, gateway or path. Shodhana = cleaning or purifying. Rounds: 10 to 20 times with each nostril. Sit relaxed in any sitting position. Just focus on the Natural breath for a number of minutes. Shut the right nostril (Nadi) with the right thumb. Breathe through the left Nadi (left nostril) twenty times. The breath should be slightly deeper than traditional and directed into the abdomen. 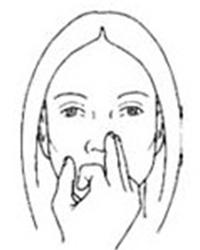 Open the right Nadi (right nostril) once more and shut the left Nadi with the Annualry (Ring finger or third finger). Breathe through the right nadi twenty times. The breath is slightly deeper than traditional and into the abdomen. Come to the hand to the knee and observe the conventional flow of the breath. Preparatory Pose: Any comfortable sitting position like Lotus poses (Padmasana). Rounds: 20 rounds starting with the left Nadi (left nostril) and twenty rounds starting with the Right nostril. Sit in any comfortable sitting pose, spine and head should straight. Elevate Right hand to Pranayama Mudra. Focusing for three to five minutes on your conventional breath. Shut the Right Nadi with the right thumb, breathe in (inhale) through the opposite nostril deeper than normal. Now remove your fingers from right Nadi, at identical time closing the left nadi with the ring finger. Exhale slowly and gently through the Right nose. Perform twenty rounds of this alternate nostril respiratory. Return the hand to the knee and focusing for two-three minutes on the conventional breath. 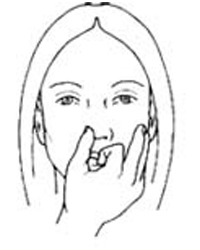 Again elevate the right hand to Pranayama gesture. Shut the left nadi (nostril) with the ring finger of right hand and breathe in deeply through the right nostril. Open the left nadi, at identical time closing the right nadi with the thumb. Slowly breathe out through the left nostril. Perform twenty rounds of this alternate nadi respiratory. Put your hand to the knee and keep focusing for three to five minutes on the conventional breath. Preparatory Pose: Any sitting pose like Lotus poses (Padmasana) or Swastikasana. Rounds: Start 10 rounds with the left nose and 10 rounds with the right nose. Start by focusing on the normal breathes for one minute. Observe the inhalation and exhalation and switch the eye towards the flow of the breath in each nostril. Place your right hand in Pranayama gesture. Close the right nadi with the thumb and breathe in deeply through the left nadi. Open the right nadi once more, at an equivalent time closing the left nadi with the Annualry and exhale slowly and relaxed through the right nadi. Inhale through the right nostril once more and exhale through the left nadi. One round: inhale left – exhale right – inhale right – exhale left. When ten rounds complete come back the hand to the knee and concentrate for one minute on traditional respiration. Return to Pranayama gesture and repeat the breath exercise starting with the right nadi: Breath in right – breathe out left – inhale left – exhale right. When ten rounds complete come back the hand to the knee and concentrate for one minute on normal respiration and also the rhythm of the heartbeat. Preparatory Pose: Any Meditation posture likeLotus poses (Padmasana) or Swastikasana. Rounds: Start five rounds with the left nadi and five rounds with the right nadi. Focus on the conventional relaxed breathing for three or five minutes. Lift your right hand and make Pranayama gesture. Count with the breath in your Mind. Shut the right nadi with the thumb and breathe in for a count of four through the left nadi. Shut both Nadi and hold the breath and count 16. Now open the right nadi and exhale for a count of 8. Again close both nostrils and hold your breath for a count of 16. Open the right nadi and breathe in (inhale) for a count of 4. Once more time close both Nadi and hold the breath for a count of 16. Open the left nadi and exhale for a count of 8. Again shut both nostrils and hold the breath for a count of 16. In Nadi Shodhana Pranayama (alternate nostril breathing), This chain creates one round. Try to practice 5 rounds and then focus on conventional relaxed breathing. After some time repeat the exercise starting with the inhalation through the right nadi. Perform this for five rounds. Best for purification of blood and Respiratory System. Deepest breathing improves the blood with oxygen. It gives strength to respiratory organs. Balance the working of the Nervous system. Nadi Shodhana Pranayama (alternate nostril breathing) gives relief in headaches, migraine, nervousness, anxiety, and stress also. Improves the concentration level of mind. Hold the breath as your capability. Those people who are suffering from intense Asthama and heart related problems are advised not to hold the breath. If you are not comfortable doing five rounds then. Keep the ratio of inhaling, retention and exhaling is 4:4:8. Once you are comfortable increase the ratio. Try to perform pranayama systematically one by one on empty stomach. 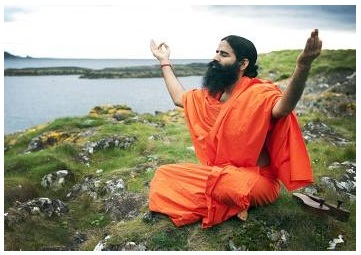 Always do Yog Asana and Pranayama in under the supervision of an expert. I feel numbness or tingling or feeling like needle insertion in every part of body…when i tried 20 rounds each nostrils lvl 1…is it normal? and why does this happen? I am suffering from poor digestion since long time…should i continue or not? @Tushar, For poor digestion do kapalbhati, do the pranayam properly, in starting do 10 rounds and after that try another pranayama. Pranayama should be done systematically one by one. so please read our Pranayama section. If you feel again needle insertion then do the yogic activities under the expert person. I think your, somwhere down the line your technique is incorrect so do pranayam correctly, small mistakes harms you. Namaste. are we supposed to complete all the 4 steps in a single session ? I’d read somewhere that each of those levels should be practiced for a few weeks before we start the following level. please guide. @Rockie, yes you can complete all the 4 steps in a single session. but don’t do it instantly before performing this you have to master in Anulom vilom and First level of Nadi shodhana Pranayama. Once you’re comfortable you can do all the four steps in one session once in a week. Thank you very much, sir. You said “Once in a week”. Can’t i do it everyday ? I do Yoga everyday and want to do Nadi Shodhana too every morning. pls guide. PS: Have been doing Anulom Vilom for a year or two. happy to see your comment again. First, perform all the breathing exercise in a systematic way. First, perform a simple version of Nadi shodhana. But if you want to do all the 4 steps then, give 5 minutes time to every step. If you want to do all the four steps every day then it will also do.if you are uncomfortable then leave it. Otherwise, carry on it is good for you.